Jimmy Carr is an award-winning comedian and host of hit Channel 4 panel show 8 Out of 10 Cats. Born in London, he is best known for his punchy one-liners and dark humour, with his stand up tours having been seen by over 1.5 million people across the globe, from the UK to Ireland, Canada to South Africa and Australia. Carr has won a whole host of awards including Best Live Stand Up at the British Comedy Awards in 2006 and Funniest Man at the LAFTA Awards in 2005 and 2007. 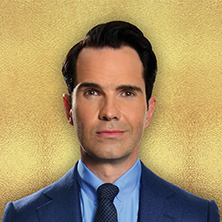 Eventim is the place to look for Jimmy Carr tickets and tour dates. To be the first to hear when more Jimmy Carr tickets go on sale you can sign up to the Eventim Ticket Alarm below. One of the most original and distinctive new stars on television, radio, stage and now the big screen, Jimmy Carr is a regular face on Channel 4 having hosted The Friday Night Project, 8 out of 10 Cats and the Alternative Election Night. He has appeared on many other hit shows such as the Royal Variety Show (for the 2nd time), Friday Night with Jonathan Ross, Top Gear, QI, Have I got news for you and hosted several specials such as The Big Fat Quiz of the Year and Comedians Comedian. Although Jimmy's profile is more as a television personality he started out and continues to be a stand-up comedian. Jimmys first live show, Bare Faced Ambition, gained him a Perrier Nomination in 2002. National sell-out tours quickly followed with Charm Offensive in 2003, Public Display of Affection in 2004, Off The Telly in 2005, Gag Reflex in 2006 and Repeat Offender last year. Jimmy is currently on tour with his Joke Technician show. Jimmy has also starred on the big screen in four feature films: Confetti, Alien Autopsy and Storm Breaker, all released in 2006, and I Want Candy, released in 2007. Finally, in Feb 07, Jimmy became the first comedian to perform in cyberspace with a special competition winners-only event within the virtual reality community of Second Life. In doing so, Jimmy obtained a place in the Guinness Book of World Records.